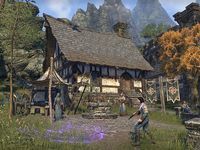 The Mages Guild at Alcaire Castle is a Mages Guild camp set up outside the castle walls. It is situated near Alcaire Stables, around a well. The camp is equipped with a tent, an alchemy station and an enchanting table. In the tent there can be bottles with either alchemical ingredients or brewed drinks. A weapon stand found near the tent can hold leveled, freely available staves. If you stay long enough, you can see Journeyman Edric practicing different spells.